ITV British actor Michael Sheen has warned of a "cold weather catastrophe" after visiting some of Syria's refugees in their tent city in Lebanon. He spent time with families living in improvised shacks, often without access to heating and basic services, at the Faida camp in Lebanon's Bekaa valley. Syrian children have lost everything - loved ones, their homes, their education - and now winter is a new and potentially deadly threat. Seeing the faces of children who had nothing receive a full supply of winter clothes - from hats to coats to thermal underwear - was emotional and showed what can be done to change lives. 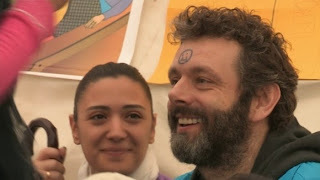 "As we begin to feel winter weather bite in the UK, I urge everyone who thinks there is nothing they can do about Syria to think again," Sheen said. "We can take action now to donate to children facing extreme conditions and help stop millions of innocent Syrian children losing their childhoods." All money raised for UNICEF's work for the children of Syria will be matched pound for pound by the UK Government until the end of January.